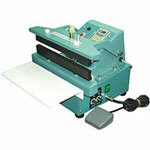 Impulse Sealers with cutters are ideal for sealing poly-tubing and plastic materials, and are perfect for applications where roll bags are used. 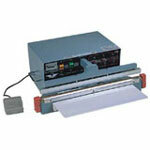 This impulse sealer with cutter is offered in 8, 12, 16, and 20 inch models. All impulse sealers with cutters come complete with a sliding blade that cuts excess material a quarter inch from the seal. 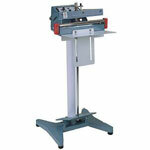 Available seal widths for this impulse sealer with cutter are 2 mm and 5 mm. 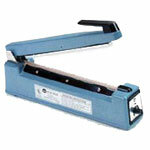 This impulse sealer is 2 mm and can seal and cut material 6 mil in thickness.